Nostalgia trip! Your first opportunity in decades to buy FIRST RECORDINGS of CONTEMPORARY MUSIC on vinyl LP! 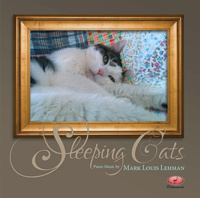 MARK LOUIS LEHMAN (b.1947): Valse Noire, Sonatina in C, Sleeping Cats, Pensive Variations. Description: As a longtime LP collector, Lehman has an affection for the format, and has for years harbored an ambition to see some of his music on vinyl. This disc actually represents something of a milestone, as it may very well be the first LP release of new, contemporary music since the current resurgence of vinyl began, the bulk of the new wave of interest in LPs consisting of rock bands issuing vinyl as a 'retro' marketing exercise, or reissues of 'classic' recordings from the 1960s and 70s. This release will doubtless appeal to two kinds of collectors; those nostalgic for the good old days when listening to music at home consisted of carefully taking the record out of the sleeve, examining it under the light at exactly the right angle to check for scratches and scuffs, gingerly placing it on the turntable, cautiously wiping it in a circular motion with a carbon fibre brush, meticulously checking your stylus to ensure that it wasn't encased in a ball of fluff from your last listening session, delicately lowering the cartridge onto the run-in groove, and scampering back to your listening chair before the first note sounded. And audiophiles, convinced that LPs are the last word in sound quality and prepared to go through the above ritual and a great deal more, in addition to having spent the price of quite a nice car (or in extreme cases, house) on their turntable in the relentless pursuit of audio perfection. Either type of listener will then have the great pleasure of enjoying this pleasing selection of Lehman's attractive, neoclassical, tonal works. The composer acknowledges Hindemith as a significant model, and his influence is certainly apparent in the clarity and economy of his chromatically inflected, elegantly structured works. The piano sonatina has an engaging hint of ragtime in the capricious outer movements, which bracket a gently sad slow movement which gives way to a more agitated central section before returning to its opening mood. The wistful little elegies for five favourite cats will also bring a lump to the throat of any cat lover who has enjoyed and lost the companionship of a feline friend. The movements are 'Lullaby', 'Pastorale', 'Idyll', 'Papillon' and 'Gently into that Good Night', and all share a mood of intimate wistfulness. The Pensive Variations are the earliest work here, and show the composer experimenting with very limited material - just a couple of intervals really - to see what transformations are possible in six elegantly restrained variants, the results sounding less confidently tonal than Lehman's later style, as exemplified by the lovely, sad Valse noire. This melancholy piece evokes a bygone world of elegance and restrained emotion in several episodes of wistful, sepia-toned nostalgia, bracketed by the initial theme. Angela Park, Albert Mühlböck (piano).